You have to plan for Turn 5. My last game ended on Turn 5 and I so desperately needed another turn to get to the objectives. Fritz from the Way of Saim Hann blog is forever winning his games because they end on Turn 5. Although I'm convinced he says "Anything but a one" when he rolls his dice. I played James in my new apartment last night (battle report soon!) and kept my Turn 5 tactics in mind. Once again, we played Seize Ground, which I'm sick to death of. I'm longing for a nice, easy game of Annihilation, which the Tau seem to excel at. He made me go first, which makes last turn objective grabbing a lot tougher. But, I kept in mind that I needed to have my objectives on Turn 5 regardless. And it worked. It worked so well in fact that we spent the 2 following turns (yes, we played until Turn 7) doing very little beyond taking pot shots at one another. Although in hindsight, I could have been far more gung ho and contested one of his objectives...which would have been risky. But instead I opted for shooting repeatedly at one of his squads, hoping I could whittle them down enough or make them break and abandon their objective. So far, it's only the Seize and Control mission which gives me problems and I have to build Turn 5 tactics around grabbing those objectives. The other missions don't seem to bother the Tau at all. In Capture & Control, you simply deploy your base marker slightly to the left or right of the centre, at the back of the board and defend it. In Annihilation you're too busy killing to care. In fact, you'd rather have as many turn as possible! I certainly did when I was playing Glenn Moore's Eldar at Carnage 2009. Stay tuned for the latest Tau VS Space Marines battle report! I just played a seize ground mission and would've won had it ended on turn 5, alas it did not. The problem I have is that Tau troops lack the staying power to hold objectives. Sure, we can clear objectives with concreted fire, but even fire warriors mounted in devilfish have trouble holding it. I think the key is in placement of objectives and in fast moving piranhas and our tanks contesting to win. It seems for a Tau army, the best place to put the objectives is out in the open in the middle of the board or close to it. Then it comes down to target priority. First your opponent's fast moving units, then troops. Once cleared of these unit, you can move out to claim one or two and contest the rest if needed. Adam, got any thoughts on seize ground? Coz I'm having trouble too. I agree Annihilation is easy for us. The key is to not even attempt to hold any objectives until at least turn 4. MAYBE as early as turn 3. Tau just don't hold ground well. At all. We CAN, however, dominate the board space with infiltrating Kroot/Hounds and Piranhas pushed into the enemy's face. Once we've possessed the midfield, we can take our time holding objectives at game's end. 1. Mobility. Who has the faster army with more surviveable transports? If you are faster, place the objectives as far apart as possible and in the open to maximize your advantage. If you can't compete in this field, put them as close together, and in the middle of the table so you can reach them from either edge. 2. Outflankers. Do you or your opponent have many outflanking units? If you run lots of outflanking kroot, put them close to the side edges in cover, if not, avoid putting objectives there, as they are an easy grab. 3. Quantity & quality of troops. Large troop units can easily hold multiple objectives now so two close objectives can be a good piece of bait for an army such as orks. Place objectives close together out in the open so they can easily be gunned down. 6 marine tac squads can easily hold 5 objectives but need to be able to support each other. Put them far apart to minimize weaken them. After the game has started you can only do so much, but as tau we have to focus on killing our opponents mobility wile keeping ours alive. Personally I use the positional relay to do this. 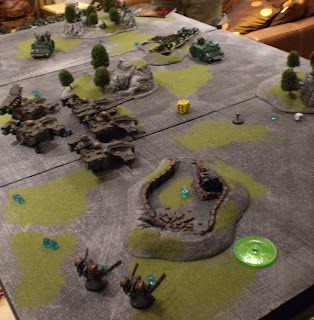 This way you can keep soft troops off the board while our suits, tanks, & snipers bait and kill your opponent's mobility.